I am not the first person nor the last to sing argan oil’s praises, but let me tell you three reasons why I love this oil, and why it is my #1 favorite beauty product of all time (for now, at least!). It is light. It absorbs quickly into my skin, and leaves it feeling so supple, flexible, and soft. It has improved the overall look and quality of my skin over time, and with this 4 oz. bottle of Pura D’or, I have used it for over three months and still have close to half the bottle left. Me likey. It’s simple. This is one ingredient that holds a powerhouse of antioxidants as well as vitamin E. It reduces fine lines, dark spots (like old acne scars, or any old scar, for that matter), it is fragrance-free, and a little bit goes a long way. It’s versatile. I can’t think of many products that I can use on my face, my eyes, stretch marks on my body, my cuticles, my split ends – I mean, you name it! It’s a wonder oil. A must-have for the all-natural beauty! 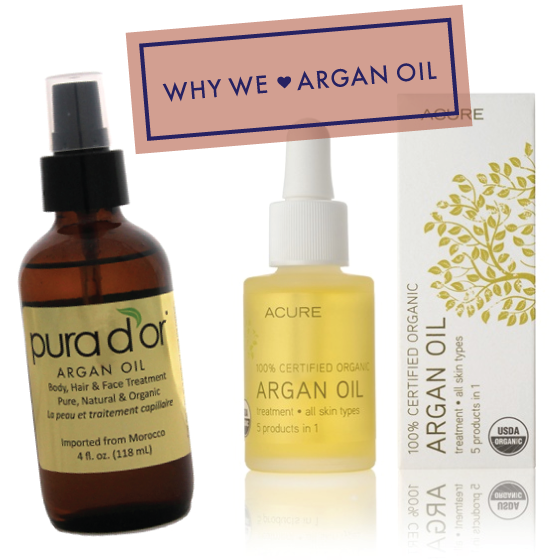 Argan oil is kind of like…the president of the natural beauty world. As soon as I started researching natural skincare last year, argan oil, which is extracted from the seeds of argan trees, native to Morocco, rose to the top of the noise. It graced the pages of almost every natural beauty blog and online store I perused. It’s listed as the “holy grail” ingredient in lawwwd knows how many serums, creams and product lines that I browsed. Plus, thanks in part to Josie Maran’s argan oil based skincare and cosmetics brand, argan oil has gained major mainstream popularity, far beyond the green beauty space. It’s typically marketed as an effective moisturizer and an anti-ager, providing springy skin and minimizing fine lines, discoloration and scarring. Well, what can I say? The hype is real, at least in my book! Argan oil was one of the first “green beauty” products that Kathryne and I tried out. I went with Acure Organics because, frankly, I love a bargain (clearly Kathryne does, too..sistas much?!). High-end, 1 oz. bottles of argan oil retail for $30+ (pretty much to infinity and beyond), so $14.99 for 1 ounce of certified organic, sustainably harvested argan oil that feels luxurious on the skin seems like one heck of a deal. I’ve even seen it for around $10 on vitamin and natural beauty sites. Whaaaaat! As my first skincare oil, it definitely took some time for me to adapt to its consistency – especially compared to the heavy, lotion-based facial moisturizers I was used to. But once I got accustomed to applying a few drops of oil every morning and night, I was hooked. Acure Organics’ argan oil is impossibly light, absorbs quickly and moisturizes super well. I can’t speak to the anti-aging effects…I always find it really hard to tell whether a product is working in that arena (any tips?). But as a daily moisturizer, I absolutely love it. While argan oil can be used for added moisture and elasticity pretty much anywhere on your body (literally from your hair to your cuticles to your feet), my face doesn’t really like to share. Even at a good price, argan oil feels too precious to smear elsewhere! BUT, I do love it on my cuticles. It’s magical. Since getting on the argan oil bandwagon, I haven’t strayed from the Acure Organics brand. In fact, I’m halfway through my second bottle! Is argan oil one of your go-to beauty oils? Which brand of argan oil do you use? I freaking love Acure organics. Out of all of the products I’ve tried from them I’ve yet to find one I do not like. I’ll pay money for some things, but products I use on the daily and consume rapidly I’m not going to shell out a lot of money. My “gateway” product from them was their shampoo & conditioner. Have you tried that yet? Oh, and the rest of their skincare is AMAZING. I agree COMPLETELY. I’m literally a nickel & diming old man on the inside. Acure Organics offers SO much value for the $$. I’ve tried their cell stimulating mask (stay tuned for another entry on that) which I also love. Haven’t tried the hair products yet but I’ve been eyeing them for months…thanks for the recommendation! Loved this post! Acure Organics is such an awesome brand and I love how affordable/accessible they are. I seriously need to try their Argan Oil now. Thought it was great that Kathryn found Pura D’Or on Groupon, I’ve definitely found some other gems there! Seriously, I’m thinking a blogger tag on bargain buys is necessary…I want to know what else is out there! I love seeing natural skincare products in the affordable range that are so high quality. For some reason I never got onto the Argan Oil train. My mum brought a HUGE bottle back from Morocco maybe 5-6 years ago which she had bought from a local woman…she loved it so much and was thinking of bringing more back to sell. She left it too late because a year or two later it was everywhere. Always think I could’ve been a rich daughter by now if only It’s kinda sad at the same time though because all of these huge companies bought the land where the argan trees grow, so the only way the locals could produce it was to collect the argan nut from goat poop – true story yo! This is so interesting and alarming – I was recently talking to a friend about the mysteries behind supply chains. You always hope that a brand’s ethos extends all the way back to their extraction/sourcing. I’ve heard similar things re: what you shared about the argan industry, I wonder if that’s offset at all by efforts from Kahina and other brands to support women’s cooperatives and jobs in Morocco. I smell a behind-the-scenes coming soon?! It’s just so intriguing and important because so many decisions I make in regards to beauty and skincare products plus lifestyle choices are done out of a desire for sustainability and respect/advocacy for our planet. But as “green” as a company may seem (recycled paper packaging, organic ingredients), there’s so much more to learn about behind the scenes – their methods of extraction and the consequences (positive and negative) on communities. That matters a lot to #greenbbloggers and maybe we should all make a bigger effort to pull back the curtain on where our favorite products originate and where they end up…cradle to grave! No wonder there are so many fake products out there claiming to be argan oil! The market is getting so saturated! It’s so weird now on TV too because has anyone else noticed there is just a PLETHORA of ads for hair and face products highlighting some kind of oil? Argan, jojoba, or just a “special” blend? Companies like L’Oreal have jumped on the band wagon, but the disturbing this is that those products are chock full of crazy scary stuff. And a little bit of an oil-like substance. K – YES, I saw the L’oreal commercial and meant to text you! Plus, the window of the Sephora in Georgetown has a giant ad for facial oils with text line “Get in on the next big trend” – all so ironic because natural beauties have been on the oil bandwagon forever. So much rave for Acure argan oil recently! I heard it’s great for blemish-prone skin and being one myself I’ve yet to try it. I might just pick it up some day soon, along with their highly-rated shampoo! It’s definitely worth a try! My acne flares from time to time and using argan oil has definitely kept it on check. It certainly hasn’t irritated it. Hope you try it out!